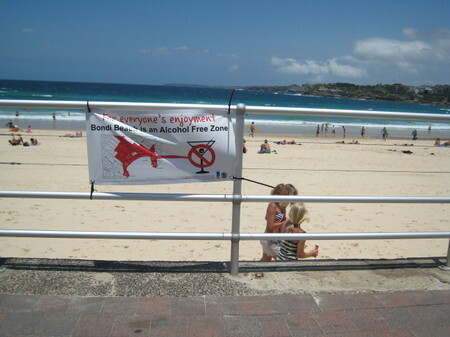 Picture: A picture of Hyde Park declaring an alcohol-free inner-city zone. Australia is often plagued by droughts like it was the case last year. But one area where dryness is actually encouraged is among the beer-loving party-crowd in Australia. Only on New Year’s Eve for example 42 people fell victim to traffic accidents and I was told about horrific bar-fights where not even the police would dare to step-in. The root of most anti-social behavior (drunken driving, bar-fights, vandalizing etc.) 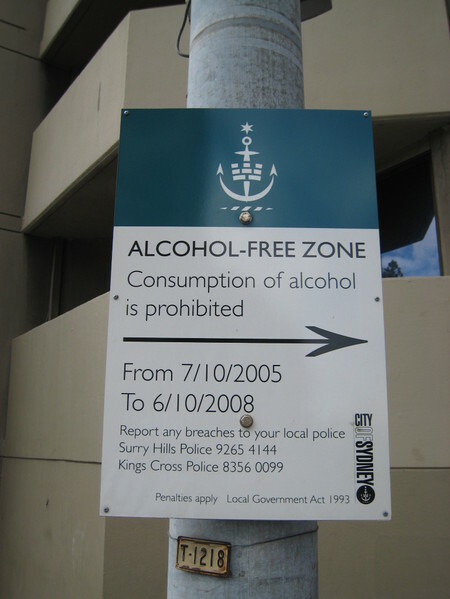 stems from alcohol-consumption so the city has erected some “dry-zones” where alcohol must not be consumed. Restaurants and pubs are not allowed to serve alcohol to underage or drunk people. Picture: Only the sea is allowed to be liquid.